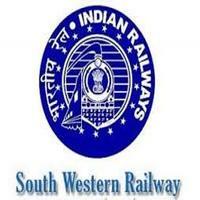 South Western Railway Jobs Recruitment Notification 2018.South Western Railway inviting applications for the positions of sports persons in Athletics, Basketball, bodybuilding, cycling, volleyball, swimming, table tennis and hockey games.Interested and Eligible candidates can apply for the positions. Total number of posts to be filled in South Western Railway is 21. Sports wise categorized vacancies are given below. Candidates those who have passed +2 / equivalent examination can apply. Minimum age for candidates is 18 years, maximum age for applicants is 25 years. Mode of applying for South Western Railway recruitment is through offline. By 09th October 2018 candidates may send their application forms. http://www.swr.indianrailways.gov.in/ is the link for candidates to download application form and send to below given address. The Assistant Personnel Officer/ HQ, Railway Recruitment Cell, 2nd Floor, Old G.M.’S Office Building, Club Road, Hubli-580023.